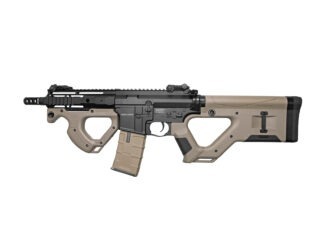 The G&G Top Tech TR4-18 Light AEG Airsoft Gun is G&G’s take on a classic favorite. It has a very solid feel, with its full metal body, and 614-style RIS system. Being that it is part of G&G’s Top Tech line, it also features their pneumatic blowback system which ads a great extra element of realism. The removable 416-style iron sights and the ergonomic pistol grip serve to make the gun aesthetically pleasing, and also make the TR4-18 incredibly user friendly. On top of that, this is a re-designed version of G&G’s original model, and is now wired to the rear, making it even easier to use. Internally, the TR4-18 also boasts a very strong 8 mm ball bearing gearbox as well as a functioning forward assist, which set it apart from other similar AEG’s. 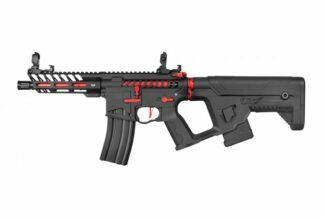 If you are looking for a great new AEG that will not only look great on the field, but will out-perform the rest, check out the G&G Top Tech TR4-18 Light.